The following is a general outline of the classroom presentation that one of our agents would be happy to make to any teacher who is interested providing their students with an overview of the mortgage application process. It has been written in such a way that you should be able to gain a good understanding of the process simply by reading the notes. The advantage of having one of our agents make the presentation is that we can stimulate conversation among the participants and will be able to get into more detail about a few of the more complex areas. If you do go through the following sections, you should at least be able to grasp the basic concepts and protocols that are required if you are thinking of purchasing a new or resale home or cottage, or if there is something you would like to look at in the case of a renewal. When all is said and done, applying and being accepted for a mortgage today is much more of a challenge for some people than it was in the past. Working with a mortgage agent you trust can be your best asset when youi are considering the options that are available. Please contact us if you have any questions about the information below, or if you would like one of us to come in and make a presentation to your class. We also make this presentation to employee groups and other community organizations whose membership includes people who are interested in finding out more about mortgages. way you will feel more comfortable and assured when you make the call and set up your first meeting. Your real estate agent is going to ask you a lot of questions to determine the kind of house you are looking for and where you would like to locate. One of the most important questions is going to be about the amount you would like to pay for your house. That is going to be a difficult question to answer, and in order to get some kind of idea of the amount of loan you may qualify for, you really should seek out a good mortgage broker. When deciding on who you will see to get your mortgage, it is necessary to examine your particular financial situation. 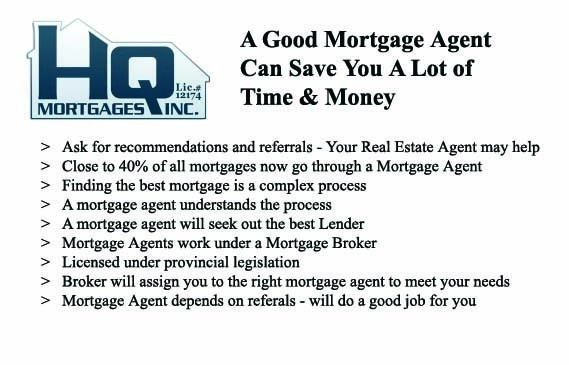 You may be able to do this on your own, but we would recommend that you call a mortgage broker like HQ Mortgages Inc. for some advice. Mortgage Agents are Licensed with the Financial Services Commission of Ontario (FSCO) and are held to a very high code of conduct standard. We would never provide advice that is contrary to your best interests, so you can rest assured that the advice you receive will be honest and practical. 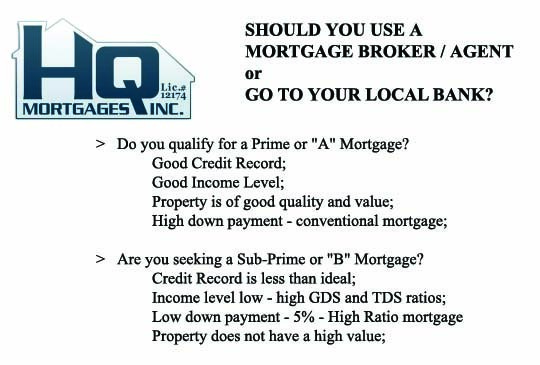 DO YOU QUALIFY FOR A PRIME MORTGAGE? If you have a pretty straight forward mortgage application to make, along with a good credit record, a good income, and a relatively high down payment, then you likely will qualify for what is called a Prime or “A” mortgage which would be accepted by just about any financial institution such as your local bank if you have dealt with one banking instution for most of your financial activities. In the case of a Prime deal, most lenders are easily convinced that you can repay the mortgage (your GDS and TDS ratios are lower than the maximum), that the amount of the mortgage is conventional with a loan-to-value ratio of less than 80%, and that the land and the house used as security are of good quality and value. In other words, there is little to no risk and the details of the application will be very straight forward. If you qualify for a Prime loan, then it is relatively easy for you to deal directly with the Lender so you would more than likely go to your local bank if you have one that already has all of your personal information and bank accounts in place. On the other hand, if you do not deal with any particular bank or you will be moving to a new community, you may still want to let your mortgage agent handle the application process in order to save you a lot of time, energy and perhaps money. DO YOU QUALIFY FOR A SUB-PRIME MORTGAGE? On the other hand you may need to apply for what is referred to as a “Subprime” or “B” mortgage. In this case, your ability to repay the mortgage may be less certain with a GDS at or near 32% and a TDS at or near 40. You may be seeking a high-ratio mortgage with only a 5% down payment, and the property being used as security for the mortgage may not have as high a value as a Lender would have hoped. You may also have some issues with your income being steady or you may be self-employed. If you will be applying for a sub-prime mortgage, you can still go through your local bank, but mortgage agents deal with many clients who have been turned down by the banks because of their particular situation. This is where your mortgage agent will be the best person for finding you a Lender who may not be as strict as your local bank and which may be willing to take more of a risk. Your mortgage agent will advise you which direction you should take and what your options are if your first choice does not work out as you had hoped. Once again, when you discuss the options with your Mortgage Agent, he/she will not steer you wrong. If it is determined that you may only qualify for a Subprime mortgage, then we would strongly recommend that you seek out a good mortgage broker/agent to help you find a Lender who will be willing to offer you a mortgage based on your particular situation. 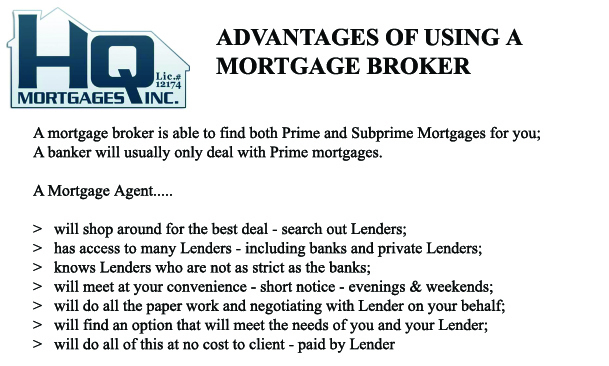 A mortgage broker/agent becomes a real advantage in a subprime mortgage situation because he/she acts as a middleman between you and the Lender. The mortgage agent gets all of your information and then shops around for a Lender who might be interested in providing you with a mortgage where a traditional banker might not. In fact, the mortgage agent likely has established a good relationship with a number of Lenders who are willing to take on subprime clients based on the recommendations of the agent alone. A reputable mortgage agent has a great relationship with Lenders and hence their recommendation is considered when deciding on issuing a mortgage. The mortgage agent also has access to a number of different Lenders who will loan money to borrowers that have been rejected by the banks, especially if the borrower is self-employed or works on commission. Another advantage of using a mortgage agent is that you know you are going to get the best rate on the market at the time. The mortgage agent will always try to find you the best rate available in addition to one that has the terms and conditions that are relevant to your situation. Mortgage Agents also meet with clients at times that are convenient to the client, so you are able to meet in the evenings and on weekends, and you will likely be able to see your agent at a moment’s notice without having to make an appointment several days in advance. The big thing to remember is that it doesn’t cost you anything to use a mortgage agent. There is no obligation to use the mortgage agent you make first contact with. Mortgage agents get paid by the Lender when they complete a deal. There is no cost to you. So whether you use the bank directly or you secure the services of your own mortgage agent to find you a mortgage, there is no cost to you. However, a mortgage agent will help make sure you have all of the paper work in hand, may save you money by finding you a better rate than your bank is charging, and will be more likely to work with you on alternatives and options that are more suitable to your situation. If you have something unusual to consider, then a mortgage agent will more than likely be more experienced in helping you build the right options and will do whatever it takes to find you a Lender. The final thing to remember is that a mortgage broker / agent lives and dies by his reputation and referrals. So you can be sure that the effort that your mortgage agent puts in on your behalf will be over and above your expectations in order for you to tell your friends about your fantastic experience. Your agent will also want you to use him in future transactions and mortgages as you move forward so the mortgage agent you choose is someone who wants to be there for you whenever you need financing for your home or other purposes. Just as you asked around for recommendations from your family and friends for your real estate agent, you should do the same to find a good mortgage broker or mortgage agent. The use of a mortgage agent has become more common in recent years. Gone are the days when everyone automatically went to their regular bank to speak to a mortgage representative working for the bank. Today, more and more people realize that it is such a complex process to get a mortgage today that they are relying on the expertise of a mortgage agent who they know is working for them and will be seeking terms and conditions that are in their best interests. 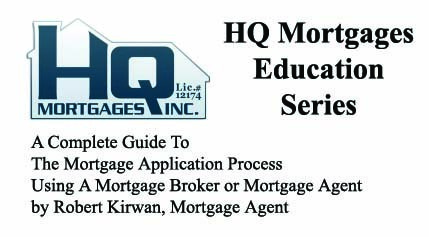 Mortgage brokers like HQ Mortgages Inc. not only depend on their professional reputation for long term success, they are required by legislative regulation to maintain the standards of the profession or risk losing their license to practice. Hence, a Principal Broker like Ryan Kirwan, who owns HQ Mortgages Inc., takes great pains to make sure that the Mortgage Agents working for the Brokerage have the skill and experience to provide for the needs of all clients. 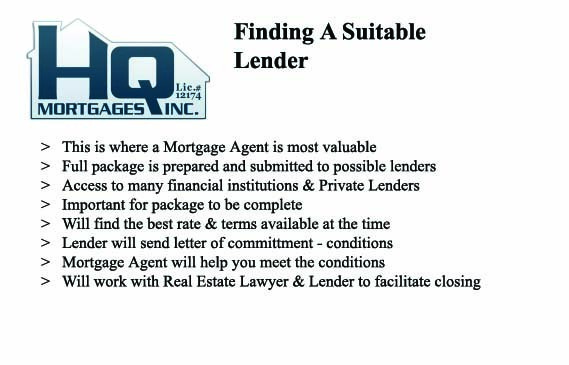 HQ Mortgages Inc., for example, has at least seven agents with a wide variety of backgrounds and experiences. You are able to contact any of the mortgage agents directly, especially if one particular agent has been recommended by your friends. Or, you can contact the Brokerage and Ryan will recommend one of his mortgage agents who he feels will be most suitable to your particular situation. Ryan is also available to be your agent if you wish. There is no point in building up your hopes for nothing, so at HQ Mortgages Inc. all of our agents will ask you to fill out an online application form and get some information about your current income level and debt load. This will allow us to do a preliminary credit check and give you an idea about the prospects of you being approved for a mortgage once you find your house. 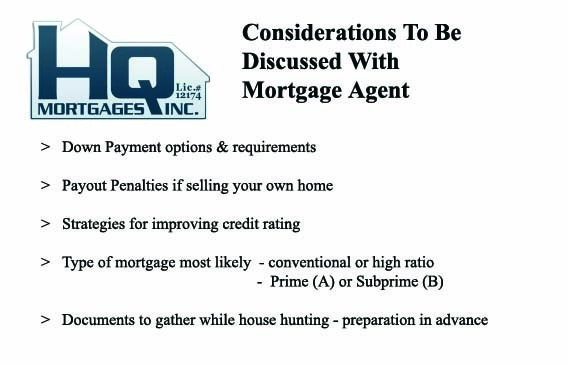 This pre-approval process is something that all of the mortgage agents working with HQ Mortgages Inc. feel is very important to conduct right at the beginning, even before you start gathering all of the necessary documents. Your credit record is critical to being approved for a mortgage. If your credit record is good, then we will talk to you about your income level and your other financial obligations in order to determine if your debt ratios are at a level where you would stand a chance of being approved for a mortgage. Your mortgage agent will explain as much as you would like to know about how credit scores are calculated, but basically, if you have been making your payments on time, you have a reasonable amount of credit, and you only have a couple of credit cards your credit score should be good. You only have to worry if you have large amounts of debt or a large number of accounts open that you need to worry. It may be recommended that you get rid of a couple of credit cards. You should also have at least two years of credit history. The credit reporting company has a complex formula to work out and will come up with a credit score for you. If you have a credit score above 680, you will likely qualify for any mortgage offered through CMHC since you will qualify for the CMHC insurance coverage. You need at least a credit score of 610 to qualify for a CMHC insured mortgage. Your mortgage agent will give you a pretty straightforward answer as to whether or not you will qualify for a mortgage based on your credit report score. If you have a poor credit record, it doesn’t automatically mean you won’t be able to get a mortgage. But based on experience, a mortgage agent will be able to give you a pretty good indication. Your mortgage agent may also be able to give you some advice on how you might improve your credit record over the course of a year to improve your record enough to qualify for a mortgage at some point in the future. Your mortgage agent therefore becomes your financial coach. We will also talk a bit about your down payment options and whether or not you will have difficulty finding the money for the down payment. If the mortgage agent does not think you are ready to enter into the financial commitment of a mortgage, you will be told so right away. We will also discuss how the purchase and subsequent new mortgage will be coordinated with the pay out of your existing mortgage if you have one. This may require some strategic planning in order to avoid a payout penalty with your current lender. It is possible that your mortgage agent may be able to find you a new mortgage that is so much less than what you are paying now that the payout penalty won’t even be a factor. It may be financially better for you to pay the penalty. Or your penalty may be added to the principal of your new mortgage if the Lender wants your business badly enough. There are many options that can be considered in order to make the decision to get a new house financially viable. You may even be able to get short term bridge financing from a private lender to cover the period in between the end of your current term and the beginning of your new mortgage in order to avoid a penalty. A higher rate of interest on a short term loan may be less expensive than paying a penalty in order to take advantage of a deal that you don't want to miss. Once we’ve done this preliminary stage, you will have a pretty good idea of the value of the house you can build or purchase. 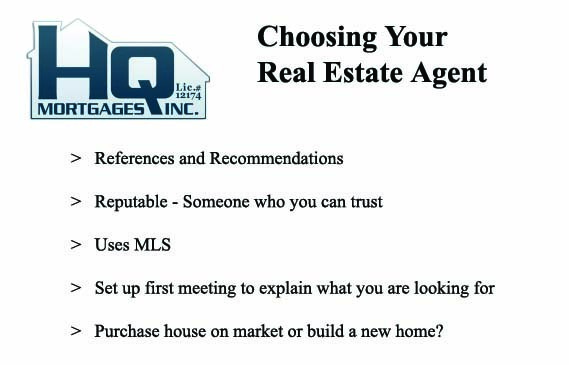 This is information that your real estate agent will need in order to find you some houses to consider. We will also give you a list of the documents you will need once you find a house you like and you make an offer to purchase. Usually you must go through the mortgage application procedure rather quickly in order to finalize the purchase, so we like you to be getting your documents in order while you are looking for that house so that when you have the signed purchase and sales agreement you will simply come in to see your mortgage agent with most of the documents you need to put through the mortgage application. Many of these documents you will have already, but some of them may require you to track them down or get duplicates. You don't want to miss out on your dream home because you were not able to get your documents together in time. Then you are ready to start your house hunting. Once you find the house you want and you have signed a Purchase and Sales Agreement, you will set up an appointment with your Mortgage Agent to begin the process of finding a lender who will best meet your particular needs. You will bring in your Purchase and Sales Agreement so that we can see the terms of the deal. There are times when you might bring this in to your mortgage agent even before you settle on the final terms. This may be necessary if there is something unusual about the terms. For example, your mortgage agent will explain some of the options you can consider such as Vendor Take-Back mortgages in order for you to be able to make the purchase. Our goal is to help you purchase your property. You will need to provide all of the information you can about the house. Usually an MLS feature sheet provided by the realtor will be suitable for this purpose. You will most likely require an appraisal for your new house, but we recommend that you hold off on that until we find the lender. Some lenders have their own preference when it comes to appraisals, so we ask that you hold off until we have some idea of the most likely lenders for your situation. It doesn't take long to get an appraisal, so there is no need to spend money on an appraisal and then find out that the Lender does not recognize that appraiser. It is better to wait until we find you a Lender and then you can get the property appraised in a manner that will satisfy the Lender. We will also need to consider the amount of down payment you intend to put on the purchase. This may require a discussion about whether you have the cash in hand; need to convert some investments into cash; or if you will be receiving a gift to help you with the down payment. Your mortgage agent will explain that many lenders are becoming much more vigilant when it comes to disclosure and they look for warning signs of fraud. Your agent will be able to advocate on your behalf by adding notes to the mortgage application explaining any peculiarities, such as money that has only been deposited from an unknown source for less than a few months. We are finding that more borrowers are either borrowing the down payment from elsewhere or they are receiving the down payment as a gift from family and/or friends. If you borrow from another lending institution, that amount will show up on your credit record. So if you have a good credit record, it should not be a problem. If you borrow from family and/or friends, you will require them to sign a gift letter stating that the money is a gift and there is no expectation of repayment. It is important that this money is designated as a gift so that it does not show up anywhere as a debt that you are carrying. There are also some lenders who are giving borrowers cash back mortgages. In this case, the borrower borrows the money for the down payment and then the lender loans the borrower the money as part of the mortgage so that the borrower can pay the money back. This sounds nice, but it does increase your mortgage and your monthly payments, so a mortgage agent will make sure you understand the consequences of a cash back mortgage. One of the things we find is that lenders are extremely flexible when it comes to the down payment. They want to loan you the money, and they are very concerned about your ability to pay the monthly payments, but they will consider many different options when it comes to the downpayment. In addition to the down payment, many lenders require that you have at least 1.5% of the purchase price available for closing costs. We too want to make sure that you are able to handle the costs of getting into new mortgage. We do not want to set you up for failure. Our reputation depends on it so we would rather be truthful with you than get you a mortgage that will result in extreme hardship for you and your family. You will be required to have at least 5% of the property’s value for a down payment. This means that if the cost of your house is $300,000, you need $15,000 for a down payment. That would mean you could qualify for a high ratio mortgage and you would be required to pay default insurance to CMHC. Mortgages are defined as being either conventional or high ratio. In order to determine whether your mortgage is conventional or high ratio, you take the value of your mortgage and the value of your house/property and if the loan-to-value ratio is less than 80% it is a conventional mortgage. If it is higher, it is a high ratio mortgage. 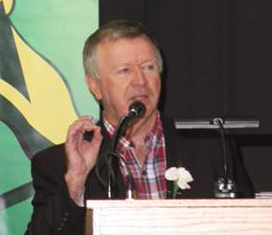 Mortgage lenders such as banks, trust companies, credit unions and insurance companies are regulated by either the Federal or Provincial governments and are not normally allowed to provide a loan that is more than 80% of the market value of any property unless the mortgage is insured by mortgage default insurance for up to 95% of the property value. Mortgage default insurance provides protection for the lender in case you default on the mortgage. If you have 20% for the down payment, you may be able to avoid the default insurance. There are some lenders who want you to take out default insurance even if you have more than 20% down payment on the house. Your mortgage agent will try to find you a lender who will provide you the best rate without charging the insurance, but that is where your agent’s experience and knowledge of the lenders comes in. There are some lenders who will rely upon a recommendation of the agent and may refrain from this requirement. This default insurance can cost thousands of dollars, but most borrowers simply have the amount added to the principal of the loan so you don’t need to come up with the cash to pay the premium. The actual fees range from zero if you put down more than 20% of the value of the house to as high as 2.75% if your down payment is only 5%. Once we have all of the above in place, we then need to verify the income of the borrowers. This can be fairly simple if you are an employee with a wage or salary and are issued a T4 slip every year. If you are on salary you will typically need a letter from your employer verifying that you are employed and confirming the salary you have reported. The mortgage agent may even contact your employer to confirm the information on the letter and indicate that he has done so to the lender, saving the lender from having to do the same. You may also be required to provide a couple of pay stubs, so you should bring those in with you. If you are a commissioned salesperson or a self-employed business owner, lenders will usually ask for the last two or three years Notices of Assessment from the Canada Revenue Agency. You will be required to bring those documents to the meeting with you since it can hold up the application process if you don’t have them. If you do not have the required Notices of Assessment, then it is going to be very difficult to qualify for a mortgage on your own because you will not have any income to factor into the debt ratios which will be explained later. However, this will not be a surprise if you are dealing with an experienced mortgage agent. 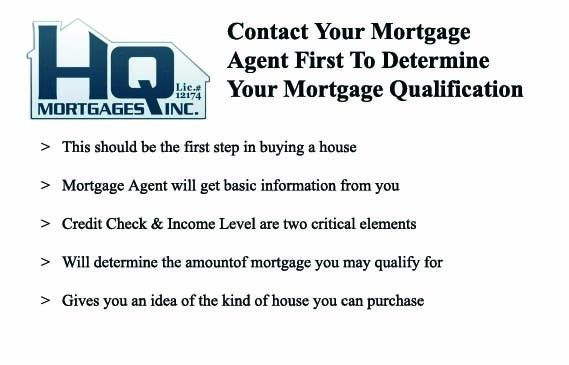 For example, all mortgage agents with HQ Mortgages Inc. ask about your income source when you first make contact with us. If you disclose the fact that you are just starting out in business and you do not have any proof of steady income, we will let you know right from the start what you are up against. There are two ratios that lenders will be most concerned with in deciding on whether to give you a mortgage or not. Your agent will explain them more carefully when you meet and he will also ask a lot of questions to determine if all of the information is being provided. Your credit record will provide most of this information. The first ratio is your gross debt service ratio (GDS). This includes all of the costs associated with your house. For example, you take your monthly mortgage payment (principal plus interest), your property taxes and your cost of heating your house. If you are buying a condominium, you include half of your condo fees. You then take this total and divide it by your Gross Qualifying Income, which is all of your income from all sources before taxes. Generally, lenders require that your GDS be less than 32% in order for you to qualify for the mortgage. If you are applying for a high ratio mortgage, where you are making a down payment of less than 20%, then the mortgage default insurance premium is also included in the GDS calculation. The second ratio that needs to be examined is called the total debt service ratio (TDS). Basically, this includes all of the payments that a borrower will be paying to service all of their debt. In order to calculate the TDS, you take all of the amounts used in calculating the GDS, plus all other debt payments such as bank and other loans, credit card payments, car payments, personal loans from family and friends or some other individual/lender, and any other regular commitments such as spousal and child support. It is important to know that items such as home insurance, life insurance, car insurance and other monthly obligations that do not repay a borrowed amount are not included in the TDS calculation. The key question that your mortgage agent will ask you is, “If you stopped making the regular payment, would you still owe an outstanding amount?” If the answer is “no”, then it would not be included in the TDS. 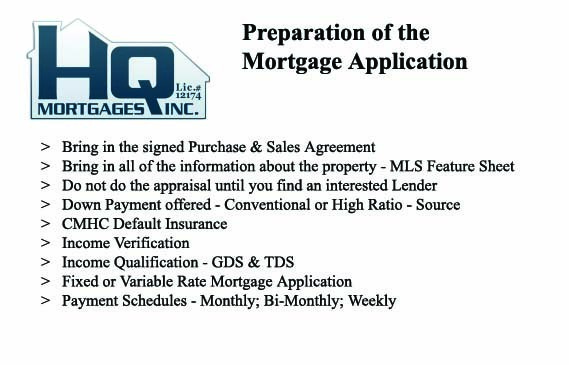 In order to qualify for a mortgage, the lender will want the TDS to be no higher than 40% of your Gross Qualifying Income. If this is a high ratio mortgage you are applying for, then the default insurance premium will be added to the total expenditures. If it is a condominium, then half of the condo fees will be added as well. If your credit score is good, then a lender may allow the GDS and/or TDS to be a bit higher than the 32% and 40% threshold. Your mortgage agent will likely advise against going higher than the recommended limits in order to help you avoid any future problems with the mortgage in the event of unforeseen problems or expenses. This is an important benefit of having a mortgage agent who you can trust and who you feel comfortable with. Mortgage Agents are held to a very high ethical standard and will not intentionally give you bad advice. They want you to be a long-term client. They also do not want to submit mortgage applications that have a good chance of being turned down because lenders also keep track of the success ratio of mortgage agents and tend to deal only with agents who provide them with complete packages and with applications that meet their requirements. So your mortgage agent is acting in your best interests. If he tells you that in his opinion your GDS or TDS is at a dangerously high level, even if he can get you a mortgage, you should listen to him and either look for a house that is less expensive or wait another year or two before purchasing. You don’t want to get into a five year mortgage and find out that at the end of the term your mortgage payments are going to go up because of an increase in interest rates and then find yourself unable to carry the mortgage. Your mortgage agent will have a very serious discussion with you about whether you would like to apply for a fixed rate mortgage or a variable rate mortgage. This is a personal decision, so your agent will make sure that you fully understand the advantages and disadvantages of both. Traditionally, variable rate mortgages have had the better track record, coming out ahead of the fixed rate mortgages over 80% of the time. Variable rate mortgages are also about 1.5% lower on average than fixed rate mortgages. Your mortgage agent will be able to let you know what the mortgage rate trends have been over the past several years and what the projections are for the coming few years. If you think the economy is going to remain rather slow, then interest rates are not likely to go up much. In that case, a variable rate might be best for you. If, on the other hand you think the interest rates are going to jump by 2 or 3% in the coming years, then a fixed rate might be the best decision. Your mortgage agent will get a feel for what you are looking for and when the application is made, he will take that into consideration. All the while, your agent is searching for the Lender who is willing to provide you with the best rates and the best terms. Your mortgage agent will talk to you about some options you have regarding the frequency of payment. For example you may want to pay monthly, or you may want to pay bi-weekly. The payment schedule impacts the length of amortization but it may require you to pay more each month, so you must be careful when deciding on the strategy that will work best for you. This is where a mortgage agent becomes your most valuable asset in the application process. Putting the complete package together in a carefully prepared manner is critical. If any of the documents are missing, the lender will delay making a decision until you get the material in. Lenders do not take kindly to mortgage agents who send in mortgage applications that are incomplete, so the agent is very careful to get everything lined up properly. For example, if you do not have any income verification, then that might require you to find a co-signer. If so, you will need all of the income verification from the co-signer that you were required to produce yourself. Plus we will need a credit record check for the guarantor. Also, it might be necessary for your guarantor to become a part owner of the house. This happens when you are required to use the income of the guarantor to qualify for the mortgage. Your mortgage agent is an expert in getting disclosure, so there may be certain factors in your particular situation that require additional documentation and explanation. Your mortgage agent will also work with your real estate lawyer to get the legal documentation and verification required for the application process to be completed. Some of this documentation is requested by the lender, but whatever can be provided by the mortgage agent will be helpful. Once all of the documents are gathered, the mortgage agent will forward the information to prospective lenders and will find the one with the best rate and terms and conditions that will meet your needs. This is where the mortgage agent demonstrates his value to the process. He is not bound by any one particular lender and even has access to many of the national financial banks and credit unions. He also has access to some private lenders if there is something that is particularly unusual about your situation. You will have your answer in a very short period of time since the lenders realize just how important it is for things to be done in a timely fashion.